Q: How are you different from other storage lots? A: We are not one of the national storage chains. This has been our family’s business since 1978. We pride ourselves in keeping our lot clean and secure. Our on-site, resident management team allows us to be open seven days a week with convenient hours. Q. How do you offer such cheap prices for Indoor and Outdoor storage? Q. How do you insure security? A. We like having an onsite manager that lives on the premises. His presence is helpful in making sure the gate is locked after hours and there is someone watching over your property. Lighting/cameras and the local police are helpful in securing our property. Q. Why do you require Title and Registration at the time of rental? A. We do this for your protection. You, as the titled owner, are the only person, unless otherwise authorized by you, have legal access to your property. We do not give out your personal information or give unauthorized parties access to your property. Q. What payment forms do you accept? A. Even though we have been a long-time cash/check only business, we aim to keep up with customer requests and will be offering credit card payments for Visa and Master Card. Q. What extra discounts do you offer customers? A. multiple unit, pre-payment (6-12 months in advance) and customer referral discounts. Q. 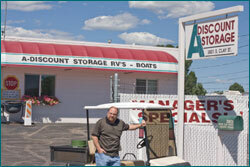 Do you have age/condition requirements on the RV, Trailers, cars parked on your lot? A. Yes, in order to maintain a clean and well maintained lot, your RV or car must be in running condition, no older than 10 to 15 years old (some exceptions can be made if your RV or car is in excellent condition). Q. Do you have a dump station for RV, Trailers, and Campers?